While being conceived in Bainville, MT, Usona Elizabeth Diseth was born October 3, 1931, in Williston, ND, to Albert and Maime Diseth. She grew up in various towns in Montana and Washington. She graduated from Glasgow (MT) High School in 1951. Usona met Neal (Pete) Larsen and was married February 9, 1952. They had three children while living in various towns in Montana. Usona helped Pete in his restaurant adventures as his bookkeeper. She also was an Administrative Assistant for the State of AK in Fairbanks, AK. She and Pete retired to Arizona in 1986. They enjoyed going back and forth between Montana, Alaska, and Arizona. In 1998 they finally returned to Alaska until Pete's death in 1999. Usona then traveled back and forth between AK and AZ until 2007 when she moved with her daughter to SD where she remained until her death. 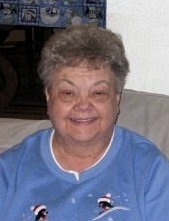 She passed away peacefully on September 12, 2010, at the Lennox Good Samaritan. Her remains will then be taken to Alaska and buried there at a later date. She is preceeded in death by her husband Pete in 1999, her mother and father, her brother Kenneth in 2008, nephews Ron Diseth (1999) and Gary Diseth (2006). She is survived by son Terry (Carey) Larsen of Massachusetts, son Tracy (Kathy) Larsen of Alaska, and daughter Kim (Mike) McCart of South Dakota; 13 grandchildren; 8 great grandchildren; sister-in-law Pearl Diseth of Washington, brother Rodney (Kum Sun) Diseth of Montana, and sister Carol (Dave) Higbea of Ohio; and numerous nieces and nephews. There will be a memorial service on Saturday, September 18, at 10 am at Ridgecrest Baptist Church, 1034 N Spring Ave, Sioux Falls, SD. Memorials may be directed to Ridgecrest Baptist Church, the Usona Larsen fund.